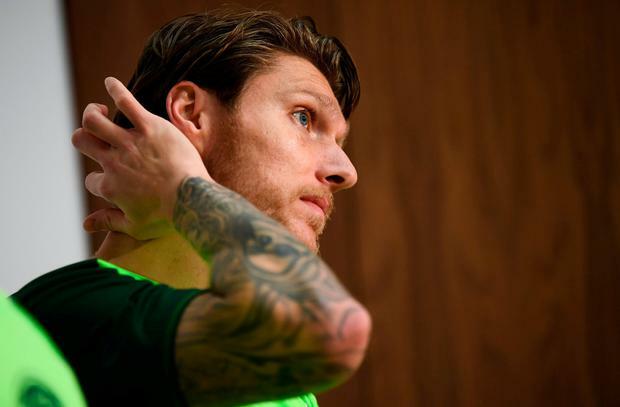 For too long now, and in more ways than one, Jeff Hendrick has been a peripheral figure for Ireland. Perhaps one of the few benefits of last Saturday's exercise in Gibraltar was the relocation of the Dubliner in a more central role. An eye-catching goal in an otherwise unwatchable display won't necessarily resurrect immediate hopes that Hendrick can be transformed into that player who dazzled on French fields the last time Ireland were at a major tournament. But at least it's somewhere to start. And that place seems to be in the position he would most prefer to play. In the middle. "It's where I have played for most of my career," says the Burnley man, who scored merely the second goal in 46 Irish appearances. "When I have been playing in other positions I have just been filling in or doing a job for the team. But I am definitely more comfortable in the centre. "The manager and TC (Terry Connor) were telling me through the week that I hadn't scored enough goals and it is something that I knew I hadn't done. "And I wanted to improve on it. Through the week, I was trying to get into the box in training and get on the end of crosses. And maybe it was imprinted in my mind going into the game. Thankfully, I scored." As James McClean and Jon Walters did in successful European Championship qualifying campaigns, Hendrick might also be staging a perfectly-timed run to be a talisman for this eight-game sprint. "I hope so. I have started off with a goal there. I am aiming to get more goals and that's what I am trying to do. I'll try to get into the box more often, get onto the end of balls in and around the box and shoot more." A fitful presence for Martin O'Neill for much of the last three years since those halcyon days in France, a surreal evening in Gibraltar will hardly remove all suspicion about Hendrick's capacity to re-establish himself as a key component of the Irish side. There were brief glimpses during the World Cup campaign but too fleeting; a goal on the opening day against Serbia, the harrying of Ashley Williams in Cardiff, prompting the mistake that would result in a smash-and-grab success. It was almost as if he embodied the listless and spiritless decline which had so vividly sparked into life during that summer of 2016. Wasted years, in so many ways. He has always been prickly, conscious of external criticism; perhaps age and experience informs him that he might have to catch up on some of those lost days. "I think I have seen some good times already," he says, grudgingly. "But I have only just turned 27, so I still have plenty of years to go. I am still improving and hopefully I will play better for my country. "I think by scoring goals, it will help me play better. Especially with people looking on, when they see my name on the scoresheet it helps. So that's what I am trying to do." Having Conor Hourihane, disciplined and restrained in support, beside him clearly helped too; far too often, Hendrick and his shock of hair have been witnessed to little effect in green, chasing the ball and imaginary opponents over vast acres, imitating great effort but producing little reward. His own personal discipline, even if offered certain other freedoms, must be reined in too. "The other night it was me and Conor, with Seánie Maguire and David McGoldrick ahead of us," he explains. "Both of us like to get forward and we both score goals at club level as well. Between the two of us, if one gets forward the other is sitting back and mopping up. "We are old enough now to know if one goes forward, the other stays. Maybe I was trying to break in a little more and get on end of things against Gibraltar." McCarthy seems satisfied when informed of Hendrick's thoughts. "Well, that's my view as well, he's a central midfield player," states his manager. "I saw him playing there for Derby and we tried to take him at Wolves. Sean Dyche will have used him where he sees best if you need someone to fill in. We all do that. "But I think if you're six-foot athletic midfielder and you get in the box - the finish he produced on Saturday with his left foot was pretty excellent - then that's where he'll play for me. Definitely. "I thought he had a really good relationship with Conor Hourihane and he's a threat, a real threat, when he's running forward. "One goal in one game is not a bad start." Hendrick must ensure it is not a false start.